Welcome back to part 2 in my fresh tomato soup series! 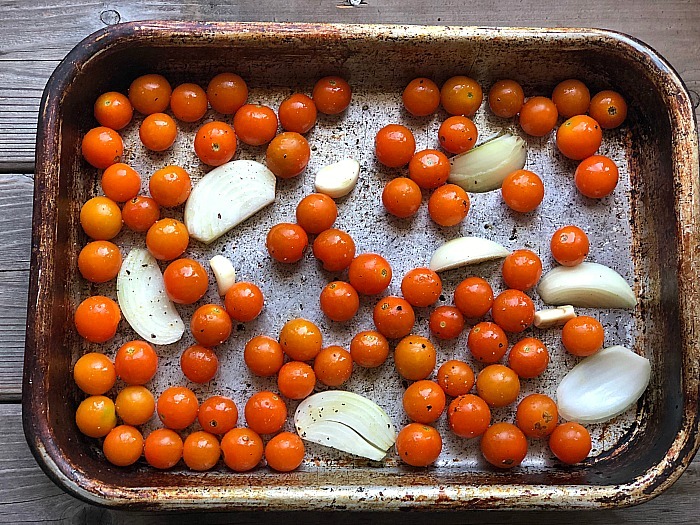 Today’s recipe is for a roasted cherry tomato soup. It’s not too much of a departure from part 1 for a basic tomato soup recipe (though parts 3 through 6 will be VERY different) but I wanted to feature a recipe that exclusively uses cherry tomatoes. Because right now, from late summer into early fall, there’s so many growing in such abundance that it’s nice to learn ways to use them beyond just, well, you know, putting them on salads. Soup is a much more economical way to use them! And you can freeze soup for those long winter months. I also wanted to make a roasted cherry tomato soup recipe that features my absolute favorite type of cherry tomatoes. 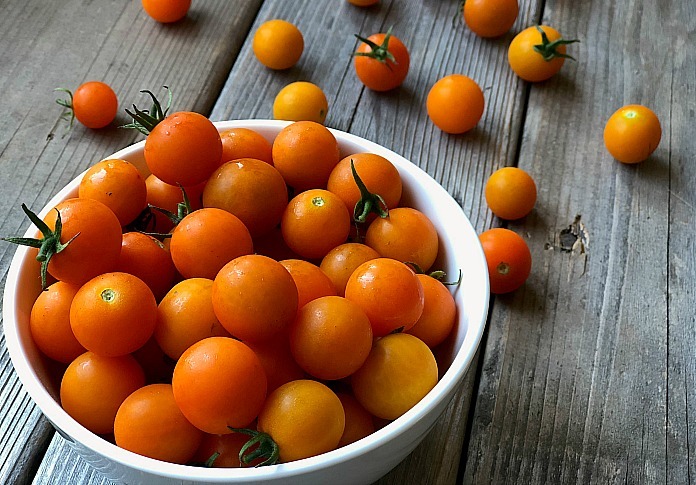 Those bright golden orange beauties are bursting with a sweet juiciness that makes them a natural fit for tomato soup recipes. And when you roast them, that sweetness deepens even further. In late summer they’re so bountiful that a thriving patch will have just as many falling to the ground as ripening on the vine. And they just keep coming and coming and coming, for weeks on end, sometimes even well into October. If you’ve ever grown then in a garden you know what I’m talking about. Supermarkets should be your last resort. Those tiny little pint-sized containers in supermarkets won’t nearly make enough! They also may not be as sweet and ripe as locally grown organic ones. Also, cherry tomatoes are not as conducive to canning as other types of tomatoes. By “canning” I don’t mean home preserving but rather the tinned tomatoes you’ll find in supermarkets. This is why a roasted cherry tomato soup is fairly unique. You have to make it when they’re in season. I recommend finding a good local pick-your-own organic farm where you can load up. I’m lucky in that my local veggie CSA has this option. Of course, growing them yourself is the best option. 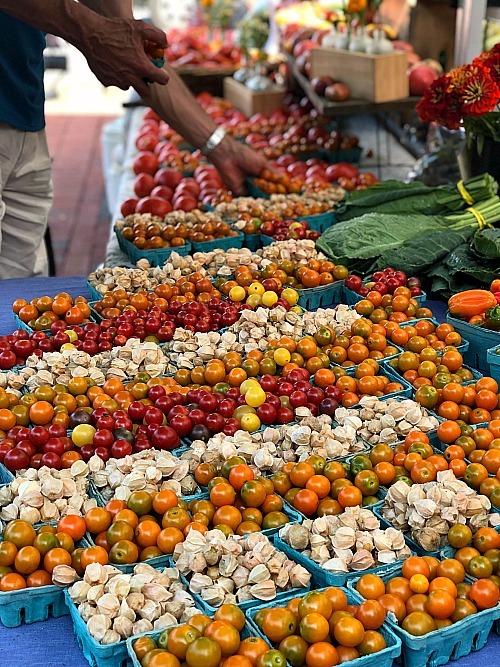 Otherwise, local farmers markets and farm stands are good options too. This time of year, almost everyone is selling them! First, you’ll need a good amount of cherry tomatoes. This is another reason why they’re not as commonly used in tomato soup recipes. For the recipe below I used 2 quarts of sun golds. This made about 3-4 servings. Double up those amounts if needed. And by the way, you don’t have to use sun golds. Use any type of cherry tomato you want. There are many varieties in many shapes, sizes and colors. Lay the tomatoes out in a roasting pan (you’ll probably need two) and add some onion and garlic. Drizzle with olive oil and sprinkle with salt and pepper. Roast at 400 degrees for about 40 minutes until browned but not charred. Now I had an interesting “accident” happen when I did this. I used two roasting pans because two quarts of cherry tomatoes didn’t fit in one pan. I set one on the top rack and one on the bottom rack in the oven. That was after 40 minutes. They browned nicely but in retrospect, I would’ve let them go a tad longer. For whatever reason (I’m guessing it was the heat distribution in my oven), the tomatoes in the other pan roasted at a much faster rate. I removed them after about 30 minutes because they were much more browned. You can see evidence of this in the cover pic (at the top of the post) of the three soups. The soup on the upper right was made from the deeper roasted tomatoes and thus has a slightly darker color. As a result, it had a deeper, most satisfying flavor. So just watch the roasting process carefully! Get the tomatoes nice and deeply browned but not charred for the best flavor. 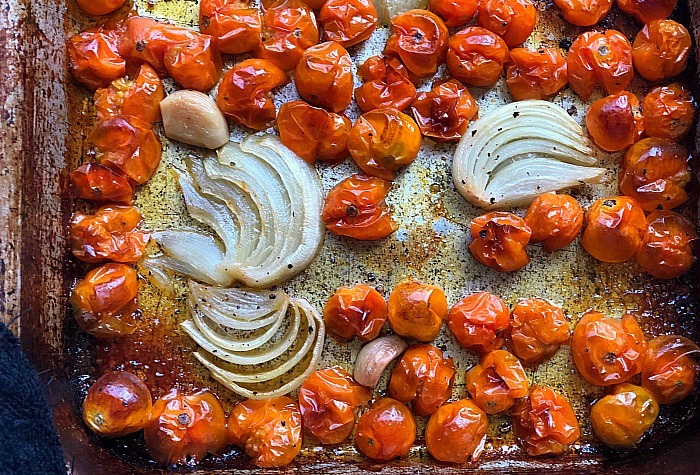 Once you roast the tomatoes, you’re almost done! 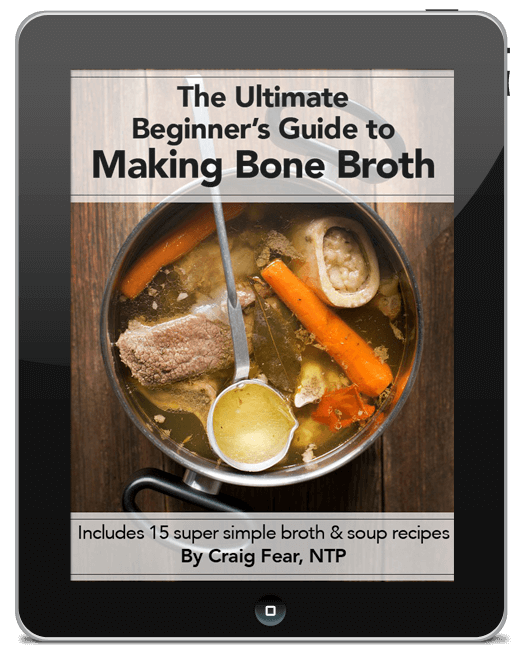 All you have to do is combine them in a stockpot with chicken broth, any herbs you want and puree it with a hand-held immersion blender. 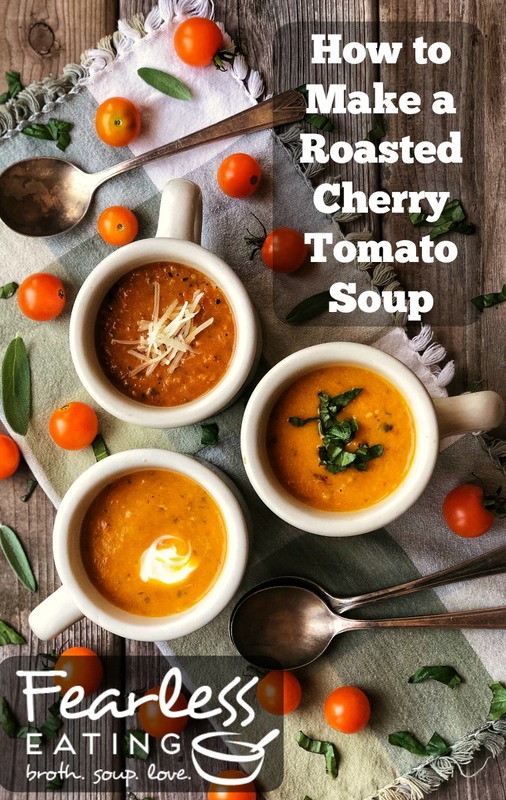 Roasted cherry tomato soup is as simple as roasting cherry tomatoes with garlic and onion, adding it to a stockpot with broth and pureeing it with your choice of herbs. 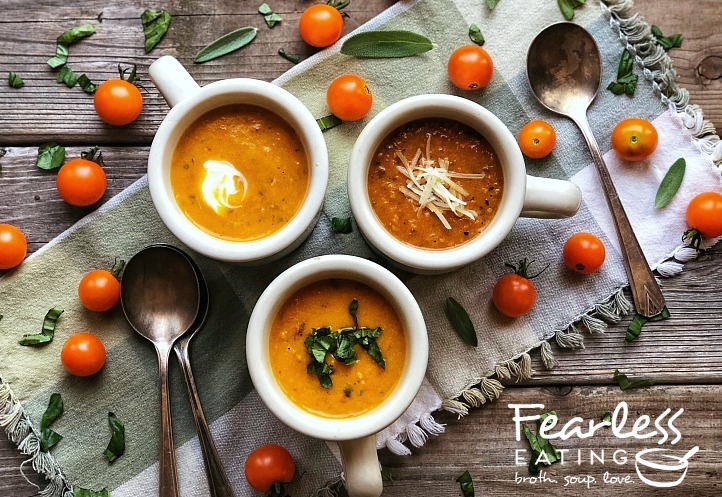 The roasting deepens the flavor and creates a deeply nourishing and satisfying late summer soup. Cheese of your choice - parmesan, romano, goat, feta, etc. For a creamy version, add heavy cream or mix in creme fraiche. Start with just a small amount (about 1/4 cup of heavy cream or generous dollop of creme fraiche) and thoroughly mix into soup and taste. Slowly add more until desired creaminess is achieved.